Researchers at the MRC Mitochondrial Biology Unit, led by Dr Judy Hirst, have used cryoEM to determine structures of mammalian respiratory complex I at atomic resolution – sufficient to see how individual amino acid sidechains change position between two different states of the enzyme. 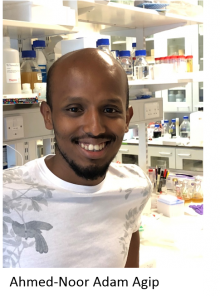 In this work, published in Nature Structural and Molecular Biology, Ahmed-Noor Agip (pictured) developed a new method to isolate the enzyme from mouse heart mitochondria in order to enable structural studies on mouse models of mitochondrial disease. However, it then turned out that cryoEM on the mouse enzyme provided much better resolution than the previously studied bovine system! The improved resolution has so far led to identification of differences in helical geometry in the membrane domain of the enzyme, which shed light on the elusive mechanism of complex I catalysis, as well as providing a much stronger foundation for studying the effects of mitochondrial disease mutations.